Rule number ONE: don't go alone. Best is to form a group of at least four. Try the southern trails in the cooler season November - February. September and October are the real hot months...no cooling breeze, go North in those months. It can be raining a lot (in August and November) and in March there is a strong wind. But you can not be sure; some years the weather is different from what it should be. Wear a hat, don't burn your face, don't get overheated, that sun is hot!! In August, October and November there can be heavy tropical rainstorms. Best times to hike: In the early morning, just after the sun gets up or in the hours before sunset. We prefer the afternoon, starting about 16.00 hours (it gets cooler with everery step). Allways bring enough water. Put a bottle half full in the freezer a few hours before you go hiking. When you are ready to go, fill it up with water from the tab. Keep Cool!! Bring a pocket light. Soon after sunset, it gets dark. Also, a light is useful when visiting caves. Do study the maps! Oh .. uh .. chances are you'll get lost anyway. Curaçao-Actief and Uniek Curaçao are working on a new set of maps with more trails and more accurate info. A walking stick is useful! To give support on muddy trails, or when you walk on rolling stones, or while you are climbing (especially down) and you can use the stick to push thorny branches out of your way. On most trails you can bring your best friend, but it should not run off and chase goats or wildlife. Give your feet proper support! 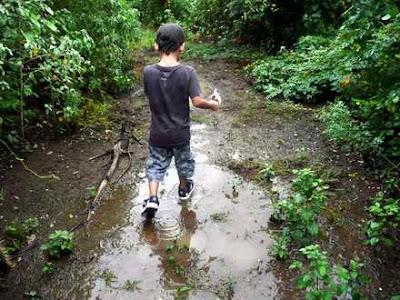 The trails can be wet, slippery or muddy. You will walk on soft sand, rolling stones, and hard sharp coral tuff (lava). A white blouse or T-shirt keeps you cooler than a dark one. Don't ever touch the leaves or eat the appels from the Manzanilla trees. They are very poisenous! In wet weather, don't walk under the Manzanilla trees and don't touch the leaves.